Scott is a Sydney based Cinematographer that has worked on a varied and extensive range of projects over his 15 years in the film & TV industry including – Documentaries, Travel and Lifestyle shows, TVCs, Branded Content, Corporate Films and Live OB’s. Scott has coordinated and filmed countless location interviews, often with minimal crew and short setup times. Scott’s personable manner, down-to-earth approach and being committed to achieving the producer’s objectives makes him a popular choice with clients. Scott is also a fully licensed CASA Drone Operator who can provide aerials for any shoot he is on or work exclusively as a drone operator. Jobs can be undertaken with 1 or 2 man crews and he can tailor the right camera and drone package for the job at hand. 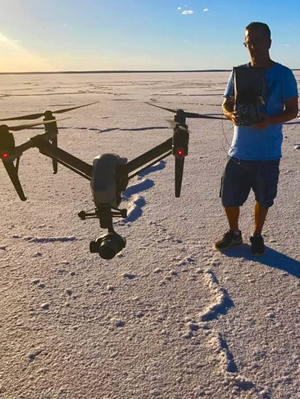 Currently the drone of choice is the Inspire 2 with both X7 and X5S cameras and a full kit of lenses, recording both Apple pro res & Raw cinema DNG, also owns a Phantom 4 pro.